Infections that affect the nose, ears and throat, such as the flu and common cold are easily spread from one person to another. Follow these five simple steps to avoid getting sick and spreading these infections to others. Keeping your hands clean is the best way to stop the spread of germs that cause respiratory infections. Make sure you wash your hands regularly with soap and warm water or use an alcohol-based hand rub to keep your hands clean throughout the day. Read more about why hand washing is important and how to wash your hands properly. Because germs are commonly spread in the air, it is important that you use disposable tissues rather than your hands or a handkerchief when you cough or sneeze. wash your hands with soap and warm water, use alcohol-based liquids, gels or wipes if you there is no soap and water. If you don’t have a tissue, turn away from people and cough into your shoulder or the crook of your elbow. Remember, hand washing is the best way to reduce the spread of germs that cause respiratory disease. Clean your home and work surfaces regularly, such as your keyboard, telephone and door handles, to help get rid of germs. You can use warm water and detergent to do this. Avoid using antibacterial cleansers (disinfectants) as these can make germs resistance to them. A very simple way to reduce the spread of germs is to stand or sit away from people when you or they are coughing or sneezing. You should try to keep a distance of 1 metre (an arm’s length). Flu and other respiratory infections can be very serious for older people, young children, pregnant women, or people of any age who have a chronic medical condition. When you are sick it is important to avoid crowded areas and stay away from these high risk groups. Remember to protect yourself and others by getting vaccinated against the flu. Expectant mothers can also find out more about flu vaccine in pregnancy. The flu and common colds are respiratory infections caused by germs. Germs are spread through the air and on surfaces. 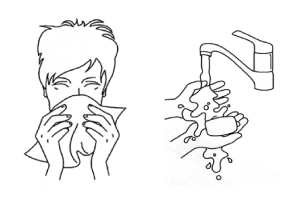 Follow the five simple steps to avoid getting sick and spreading germs to others. Protect yourself and others by getting vaccinated against the flu.